WASHINGTON, D.C. -- Sixty-six percent of Americans now support legalizing marijuana, another new high in Gallup's trend over nearly half a century. The latest figure marks the third consecutive year that support on the measure has increased and established a new record. 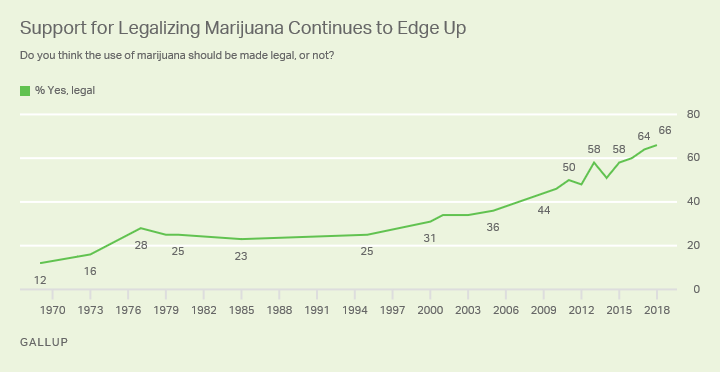 Legalizing the use of pot was an unpopular idea when Gallup first asked Americans about it in 1969 -- just 12% at that time said it should be made legal. Support grew in the 1970s but stagnated in the 20% range until the new millennium, when momentum for legalization picked up again. Since 2000, support for legalizing marijuana has trended steeply upward, reaching majority support for the first time in 2013 -- a year after Colorado and Washington voters legalized recreational use of marijuana via ballot initiatives, making them the first states to do so. Marijuana use continues to be illegal at the federal level. 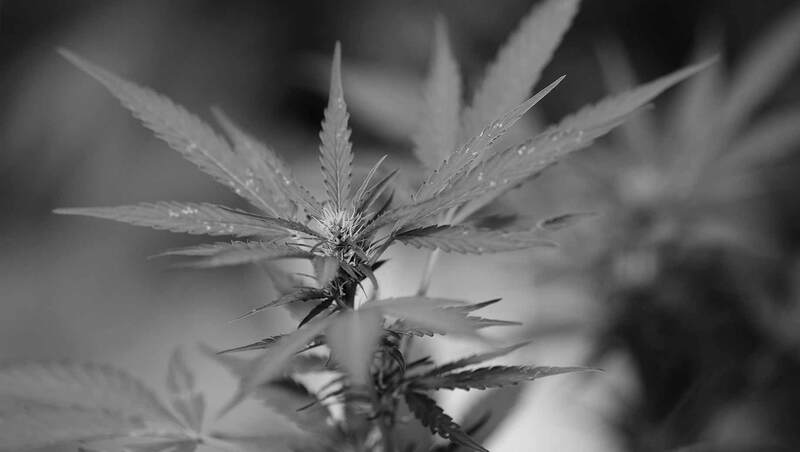 The Oct. 1-10 Gallup poll was conducted before Canada last week became the second country in the world to legalize the recreational use of marijuana. In the U.S., voters in four states are voting this year on measures to allow for recreational or medical use of marijuana. Support for legalization in the U.S. has continued to grow, even as Attorney General Jeff Sessions has pledged to crack down on marijuana at the federal level. But Sessions' own department has done little to actually carry out his demonstrated opposition to legal marijuana, and states have continued to legalize it since Sessions took on his role. Moreover, President Donald Trump undermined his attorney general's pledged mission over the summer when he indicated he would likely support a bill to allow states to determine their own marijuana policies. Sessions' opposition to legalization is further undercut by shifts in attitudes among his own political party. Gallup found last year that a slim majority of Republicans supported legal marijuana for the first time, and this year's figure, 53%, suggests continued Republican support. 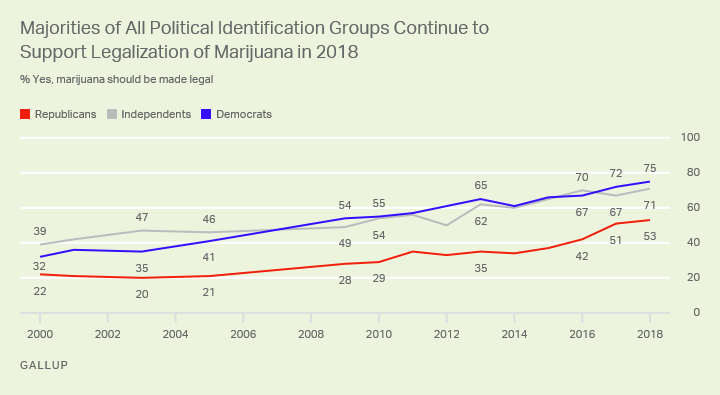 Views that pot should be legalized have also reached new peaks this year among Democrats (75%) and independents (71%). Democrats reached majority-level support for legalization in 2009, and independents did so in 2010. Among Americans aged 55 and older, views that marijuana should be legalized now surpass the majority level, with 59% support, up from 50% last year. Meanwhile, solid majorities of younger adults have supported legalization for several years. Support is strongest among adults aged 18 to 34, at 78%, while nearly two in three adults aged 35 to 54 (65%) approve of legalizing marijuana. In 2009 and 2010 -- before any state had legalized pot -- support for legalization reached the majority level in only one U.S. region -- the West, at 56%. And in most polls since, residents in the West, along with Eastern residents, have led the remaining regions in favoring legalized pot. But attitudes about legalization have changed more recently: In 2017 and 2018, support for legalization of marijuana is about even in the East (67%), Midwest (65%), South (65%) and West (65%). Like support for gay marriage -- and in prior years, interracial marriage -- support for marijuana legalization has generally only expanded, even if slowly, over the course of multiple decades -- raising the question of where the ceiling in support might be. As the percentage of Americans who favor legalizing pot has continued to grow, so has the number of states that have taken up legislation to allow residents to use the substance recreationally. States that permit use of medical marijuana are even more prevalent in the U.S. than states allowing recreational pot are. After this year's elections, recreational pot use could be allowed in two more states, depending on what voters decide in North Dakota and Michigan. Both of these states border Canada, whose adult residents now have access to legal marijuana nationwide. Meanwhile, state lawmakers in New Jersey are moving closer to passing legislation to legalize pot, and neighboring New York might not be far behind after the state's health department conducted a study that led to its recommendation that marijuana be legal. But even as many states take action to legalize pot, to date, no Midwestern or Southern states permit legal recreational use -- though medicinal marijuana is allowed in a few of these states. Now that public support is consistent across U.S. regions, legalization could spread to new areas in the future. Results for this Gallup poll are based on telephone interviews conducted Oct. 1-10, 2018, with a random sample of 1,019 adults, aged 18 and older, living in all 50 U.S. states and the District of Columbia. For results based on the total sample of national adults, the margin of sampling error is ±4 percentage points at the 95% confidence level. All reported margins of sampling error include computed design effects for weighting. When asked about six tobacco or smoking products, Americans say they use cigarettes most regularly and also consider them most harmful to users. Marijuana, the second most regularly used substance, is viewed as the least harmful. Thirteen percent of U.S. adults "regularly" or "occasionally" use marijuana, but the rate is higher among young adults and Americans living in the West. More than three-quarters of U.S. adults believe drinking alcohol is morally acceptable while 65% say the same about smoking marijuana. Given a choice, Americans are significantly more likely to want political leaders in Washington to compromise rather than stick to principles.